My wife had 2 Uncles stationed at Pearl Harbor on Dec 7, 1941. Her Uncle Clarence's Ship was underway when the attack occurred. Her Uncle George was a crew member of the USS West Virginia (we think). He was not on board when the attack started. He and his wife had just picked up his brothers wife and 2 children and were about to enter Church when the attack began. Attached is a photo (which belonged to George Kenneth Bueb) of the USS West Virginia. He hand wrote on the back of this photo "The Pride of the U.S.N. Jan 7, 1930". 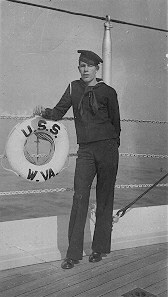 I am also attaching a photo of George Kenneth (Kenny) Bueb standing on the deck of the West Virginia. Don't know exactly when this photo was taken, but probably late 1930's. I see that you have the muster rolls for the WV. Could you check and see what dates George served on the ship? We would be most appreciative. Hope you like and can use the photos. George is no longer with us, he past away in 1987.